We’ve made exciting progress on our mission to bring thoughtful literacy instruction to all content areas. After months of thoughtful planning, preparation, and review, the first of many differentiated math sets has been added to ThinkCERCA’s continuously growing lesson library. 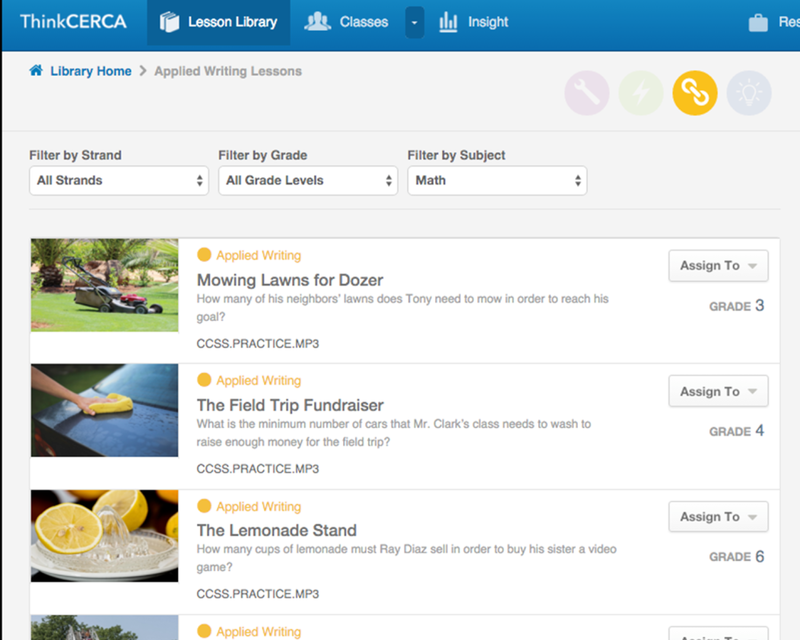 ThinkCERCA added math lessons in response to teacher requests to support students in developing writing and critical thinking skills in math content areas and to complete our whole-school solution for writing and critical thinking. These math lessons help prepare students to take rigorous math assessments, as well as apply their math knowledge to real-world problems. We collaborated with Professor Doug O’Roark, founder of the Graduate Math and Science Teacher Certification Program at University of Chicago and current head of Math Circles Chicago, to design a unique, standards-aligned approach to differentiated math literacy content that serves every student at their level of readiness while maintaining cohesion in the classroom on topic and skill. ThinkCERCA’s math content mirrors our lessons for other subject area, providing a coherent solution for literacy across the curriculum. These lessons are designed to support the expansion of mathematical knowledge through its application in writing. After a new topic has been introduced and practiced, students will analyze a word problem and build an argument through ThinkCERCA. Prerequisite knowledge and abilities are associated with each differentiated lesson to help teachers determine where to place students to help them practice writing about the math they already know. Use these lessons at the end of an appropriate math unit to give students an opportunity to demonstrate both their math content and math practice skills through writing. How do businesses make money? In our first math CERCA Set, we explore the foundations of mathematical writing and communication of equations in words. Like all our CERCA Sets, the Businesses set includes a minilesson, a differentiated applied writing lesson, and additional close reading lessons to build further background knowledge. Our math minilessons introduce students to the key concepts of math literacy, including making arguments about math and translating words into symbols. We recommend assigning the minilesson “Writing Math Sentences,” which breaks down equations as a representation of a word problem, before asking them to complete the corresponding applied lesson. Students will learn about the composition of math sentences through the understanding of relationships between numbers and variables, order and signs, and equations and inequalities. Once students have completed their minilesson, you can assign the appropriate Businesses applied lesson based on their readiness levels. This set includes lessons at each level for grades 3-8, and lessons by grade band for 9-10, and 11-12. Students will follow the same six-step process as seen in other applied lessons; students will make a connection to the topic, demonstrate understanding of text, analyze data, summarize the problem, build their response, and create an argument. A new button has been added to the right-hand side of navigation bar, directing you to resources support. Our resources page houses everything from curriculum integration guides to case studies, and classroom strategies to assessment prep ideas. In addition to our live chat, you may have noticed a new communication tool pop-up in our application. We’ll be using this space to share pertinent information such as product and content updates with you in addition to upcoming contests, events, and webinars. We will use this tool to check in with you, too. It’s just one more way for us to communicate important information, like updates and new events, with our teachers and administrators. As always, we’d love to hear your feedback. Please let us know if you have any questions about these updates, or feel free to suggest a topic for the next math set!